VATICAN CITY (CNS) — Jesus brought humanity God’s merciful, saving love, not hatred and animosity, Pope Francis said. “Jesus makes visible a love open to everyone — nobody excluded — open to everyone without bounds,” he said at his weekly general audience in St. Peter’s Square April 6. 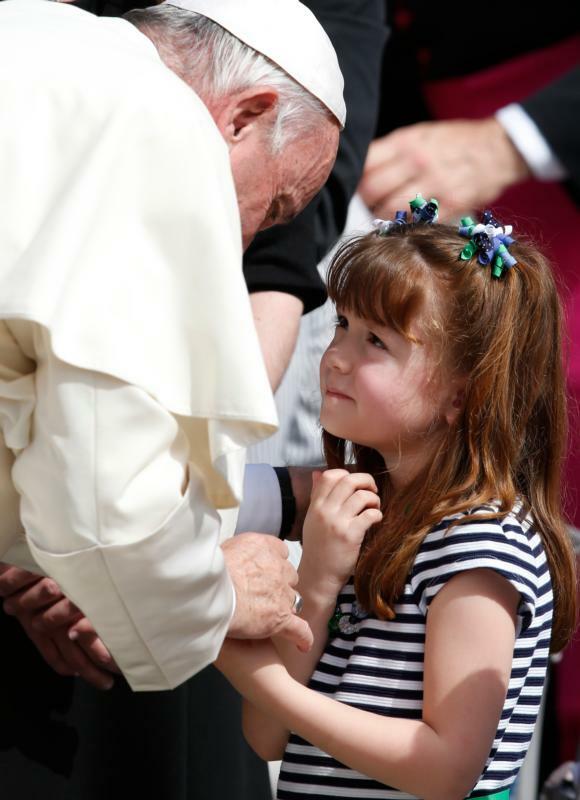 The pope also met with and blessed the eyes of 5-year-old Lizzy Myers from Mansfield, Ohio. Struck by a rare disease that is gradually rendering her deaf and blind, Myers was in Rome after a representative from Turkish Airlines heard about her story and offered her and her family free round-trip airfare to any city in the world. Her parents, Steve and Christine Myers, had created a “visual bucket list” of places and things they wanted Lizzy to see before she loses her sight due to Usher Syndrome Type II A. They chose Rome and the Vatican to be their special destination because they are Catholic and because of the city’s artistic and historical riches, they told Associated Press. After meeting with bishops and a few special delegations at the end of his general audience, Pope Francis went directly to Lizzy Myers, who was seated with her family in a section reserved for those with special needs. He leaned over her for several minutes, speaking with her and then laid his right hand over her eyes, offering his blessing. During his general audience, the pope continued a series of talks dedicated to God’s mercy and reflected on how this mercy was fulfilled in Jesus. The New Testament “is truly the ‘Gospel of mercy’ because Jesus is mercy,” he said. At every moment in his life, Jesus showed love to everyone: a love that is “pure, free and absolute,” the pope said. His driving purpose was “to bring everyone the love of God who saves; Jesus didn’t bring hatred, he didn’t bring animosity, he brought us love, a great love, an open heart for everyone, for all of us,” the pope said. The great mystery of this love is seen in the crucified Christ, the pope said, because “it is on the cross that Jesus offered to the father’s mercy the sin of the world, everyone’s sins, my sins, your sins” and took those sins away. “Nothing and no one remains excluded from this sacrificial prayer of Jesus,” which means “we mustn’t be afraid to acknowledge and confess ourselves as sinners,” he said. People never need to fear their burdens and sins because “the power of love of the crucified one knows no obstacles and never runs out” as it wipes away human sin, he said. When greeting special delegations at the end of his audience, the pope met with Cardinal Timothy M. Dolan of New York, who was heading to Iraqi Kurdistan to show solidarity with the church there. The cardinal, who is chairman of the board of the Catholic Near East Welfare Association, was traveling there with other members of CNEWA and church leaders. The pope also met briefly with and posed for a group photo with members of a diocesan pastoral association in Italy for separated and divorced Catholics. A representative of the group, “L’Anello Perduto,” (the lost ring), had received a phone call from the pope in February, according to Vatican Radio, after group members sent a letter explaining their formation program and requesting a papal audience.